Pilates is a practice, a method to organize bones, muscle and soft tissue. Pilates is a practice, a method to ensure the spinal curvature is corrected, the discs are bouncy and the dural port is free from impingement. Pilates is a practice, a method to pump vitality (chi) (life source) from sacrum to cranium and around the brain to keep the immune system happy and healthy. Pilates is a Private Matter because your physical system is one of a kind and must be dealt with specifically for your personal discovery. Our team of teachers brings Joseph Pilates’ original intention to each person in a private experience, discovering a deeper intelligence. ‘Scientific artists’ for centuries knew the unique system of the human body has the ability to heal itself. 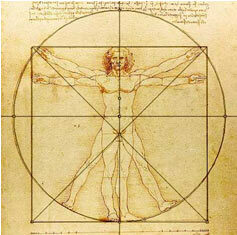 In 1490, Leonardo Da Vinci’s pen and ink drawing of ‘divine proportion’ or ‘golden ratio’ gave to humanity an architectural correlation that the human figure is the principal source of proportion among classical orders of architecture. Through his subsequent research and drawings of each body part, he taught us that a person’s gait must equal the length from knee to foot so the ‘figure eight’ movement of the pelvis will move with ultimate motion and the spine not will lock into discordant patterns. Joseph Pilates knew that a healthy spine is a healthy person. He knew that if a person keeps the spine mobile, a person embodies a stable structure and strong immune system.